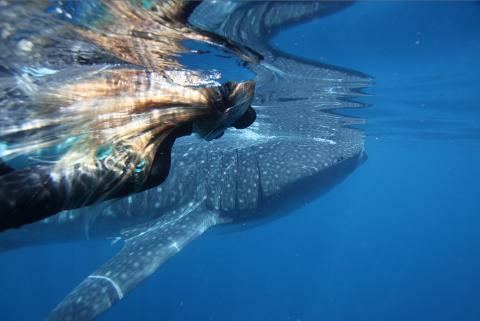 Whale sharks are frequent visitors to the Ningaloo Reef, even after the official whale shark season is over. This means that on board our Eco Tours which run from August to October guests will also have the opportunity to swim with the whale sharks during the shoulder season, when sighted by our spotter plane. 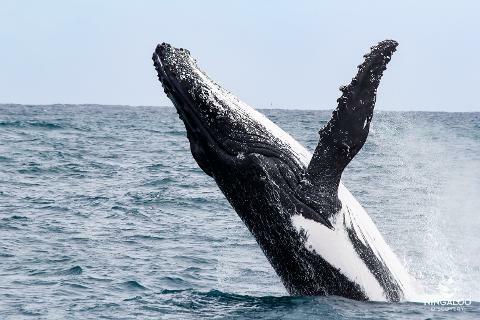 The Ningaloo Reef is alive with marine wildlife during the month of August and on any given day Mother Nature may present the opportunity to view or swim with Manta Rays, Whale Sharks, Humpback Whales, Turtles, dugongs, dolphins and a huge variety of tropical fish and corals. We offer guests the most stable and comfortable viewing platforms to view and interact with this wildlife from the decks of our 60ft luxuriously appointed sailing catamaran. 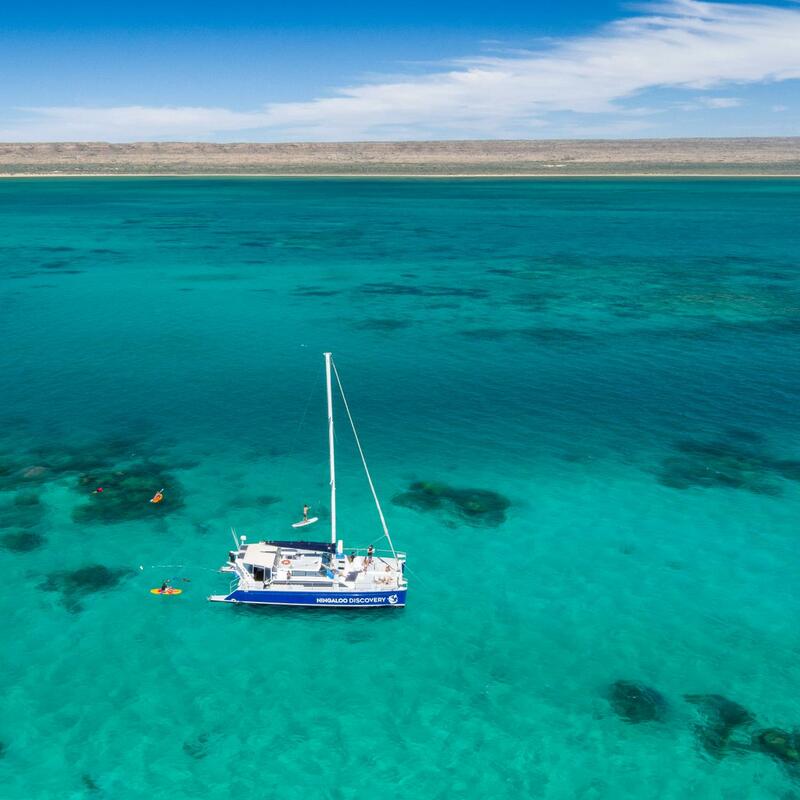 Join us for a day out on “Windcheetah” as we set sail through the shallow turquoise lagoons and along the back of the stunning Ningaloo Reef whilst stopping to take advantage of whatever spectacular wildlife comes our way. 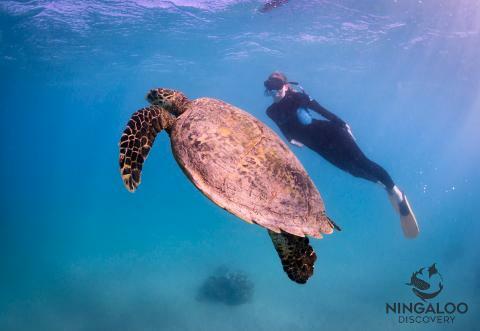 Your day includes the opportunity to snorkel the reef, view Humpback Whales, spot turtles, dolphins and dugongs. If the opportunity presents itself to swim with a Humpback Whale or Whale Shark the option is there to upgrade onboard on the day for an additional "Humpback Whale/Whale Shark Swim Fee" of $50 cash per person. We also often encounter the curious and interactive Manta Rays and do our best to get you for a swim with these inquisitive and majestic creatures at no extra charge. Weather and time permitting try your hand at one of our Stand Up paddle Boards or a kayak during the afternoon snorkel for a different view of the reef. - Starting from 7:45am, you will be picked up from your accommodation and taken out to the Windcheetah sailing catamaran where you will be greeted by our friendly crew and fitted with masks, snorkels, fins and wetsuits. 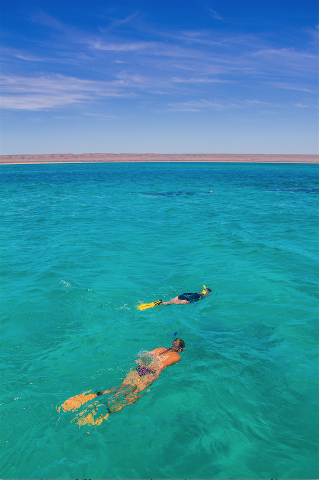 - Moments later immerse yourself in the crystal clear waters of Ningaloo Reef at one of our beautiful snorkel spots in the sheltered lagoon. Here you will see an array of corals and colourful fish, sometimes even turtles and rays! Take this time to ask questions, get snorkelling tips, make sure your gear fits and practice getting on and off the boat before swimming with any marine life. - Now you can enjoy morning tea as our plane gets searching for any marine life in the area, anything the pilot finds, we will get you up close with the boat to observe. If a Humpback Whale or Whale Shark is spotted the pilot, skipper and crew will asses the conditions and if deemed suitable, guests wishing to purchase an upgrade will be directed to put their snorkel gear on and we will do our best to get you interacting with them in the water! All guests will be invited to swim with a Manta Ray if we find one at no charge. - Enjoy a delicious buffet lunch as we cruise the reef in search of any other wildlife that may be around on the day. - Relax with some refreshing afternoon tea and a glass of sparkling wine on our way back to shore before the crew return you safe and sound and full of smiles back to your accomodation. - The experience lives on as we will provide you will all the photos of the day taken by our professional photographer free of charge!!! Complimentary bus transfers from your accommodation in Exmouth to the boat ramp and return. Flying in to Learmonth on the early flight? No problem, for an extra fee we can pick you up form the airport and take you directly to the boat. 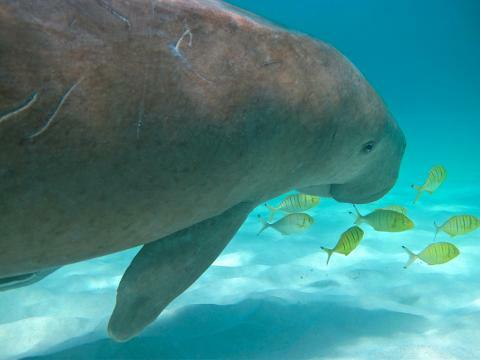 You could be swimming with marine life the same day! Experienced, professional award winning crew on board and supporting you in the water as much as you need. Interesting informative spiels about the area and the marine life will keep you entertained too. Spotter aircraft to ensure best possible opportunity of sighting and swimming with marine life such as Humpback Whales, Whale Sharks and Manta Rays! Opportunity to swim with Whale Shark and/or Humpback Whale on the day if we locate them. The government "Humpback Whale/Whale Shark Swim Fee" is just an extra $50 cash per person, not per animal! 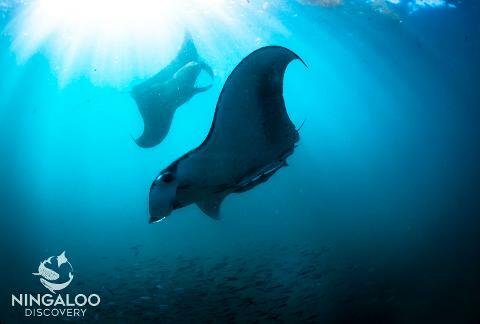 No charge to swim with Manta Rays if we encounter them! Complimentary Professional Photography Package of the day. Thats right, ALL THE PHOTOS FOR FREE! See what our guests say about us! Don't take our word for it! Check out our Tripadvisor Page and see what other travellers have said. We pride ourselves on all our amazing reviews and would love you to take a look for yourself!